Lotus F1 Team is about to go live with a converged datacentre infrastructure as it begins the development of a championship-winning car for 2015. Speaking at VMworld Europe, deputy IT/IS director at Lotus F1 Team, Michael Taylor, said Formula One is the most technologically advanced sport in the world and that IT is a key aspect to support the Formula One team. The company has a four-year relationship with EMC, which is a development partner for 2014. "The focus of the partnership is about transforming our existing infrastructure to challenge," Taylor says. IT is a fully signed up member of the race team. Taylor says: "In terms of IT jurisdiction we cover everything: design, R&D, engineering and trackside." Getting the right data to the right people at the right time is a tenet of good business analytics. In F1, analytics is used at the design stage and on race day. "Formula One is all about aerodynamic development. We evaluate our performance and our competitors. Every single track is different," said Taylor. Car development involves bringing together complex fluid dynamics simulation data, wind tunnel data from a 60% scale model of the race car and actual track data. The 2014 season represents a quantum shift in regulations for Formula One. The cars will be moving away from a 2.4 litre V8 engines to 1.6 litre turbo-charged engines. The teams will need to produce greener, more fuel-efficient cars. There will be a 100kg fuel limit. "We have had to work had to work on 2014 regulations for the last two years. 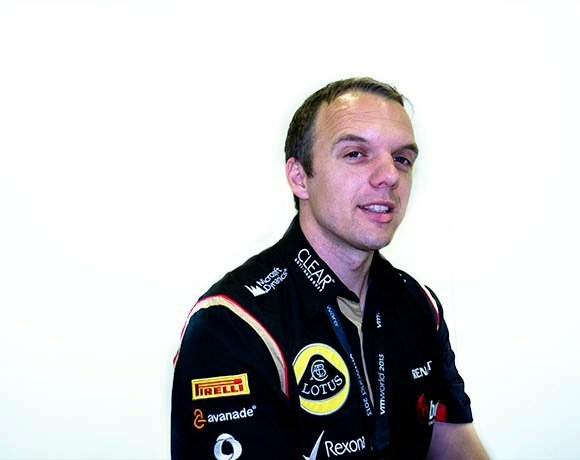 We need to balance our resources and technology," said Michael Taylor, deputy IS director at Lotus F1 Team. Taylor said: "We bring together data from the wind tunnel on a 60% scale model, with the actual performance we see on-track and how we can then feed the mathematical equation between these into the development of a superior CFD simulation for the on-going improvement of the car." A Formula One car is a product of prototypes and can have 30,000 updates during a season. During the season, race engineering would work on 15,000 drawings. There is a massive data challenge. It is not necessarily in terms of sheer data volume but the amount of change. "We can produce 100GB of CFD data an hour." In a typical grand prix race, Taylor says the team can collect 50GB of data. Trackside analytics means IT can give race engineers a competitive advantage. He says: "For the engineers, a tenth of a second make a difference. For instance, if it takes 80 seconds for a driver to do a lap and another 80 to process a lap, then taking a decision to bring the race car into the pits could be impacted, because the driver may have to do another lap before pitting. If we reduce the cycle time we can improve our race strategy," which makes IT as much a part of the team as the race engineers. Lotus F1 Team's current datacentre is configured using a multi-layer switch network. It is based on a single datacentre with physical and virtual servers. The architecture uses manually tiered NAS storage. For the past six months, the team has been building a new datacentre infrastructure architected as scalable and agile private cloud. The technology blueprint is based on the need for quick provision using active datacentres to load balance and share between the two sites. Taylor says: "We have simplified our IT architecture through an EMC partnership to provide converged infrastructure." The private cloud provides policy-based tiered storage built on VCE vBlock. Taylor says: "We tier storage so that hot data is in right place." Having data where it is needed at the tight time can be the difference between winning and losing a race. Along with VCE vblock, Lotus F1 Team is using EMC VNX storage arrays, Atmos object storage and VMware virtualisation software. It will also add to its datacentre with EMC VNX arrays. IT has to support these business requirements, provide compliance data and do all of this within a budget, Taylor says. Any savings that are made by keeping IT costs down, can go onto car development, Taylor says. "If you can drive efficiency, the overall effort can go back into the team." This will be a factor as the team prepares for the 2014 season: "We have had to balance resources to develop this year's car and next year's car, and do simulations and predictive analysis." Taylor said the race engineers have access to plenty of historical data, which can help them determine optimal race strategy for a particular track: "There may be something from regulations ten years ago for a certain track that is relevant now." This is why immediate access to the archives is important: "We want too be able to give the engineers the information they need rather than for them to go out and find it."